Some dogs eat more than that. Smaller dogs eat less. Many people travel with their dogs. In fact, over 18 million Americans will travel with their pets this year. 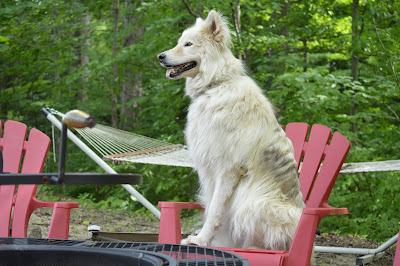 Independence Day falls on a Saturday this year, and many folks will spend the holiday weekend camping with their dogs. 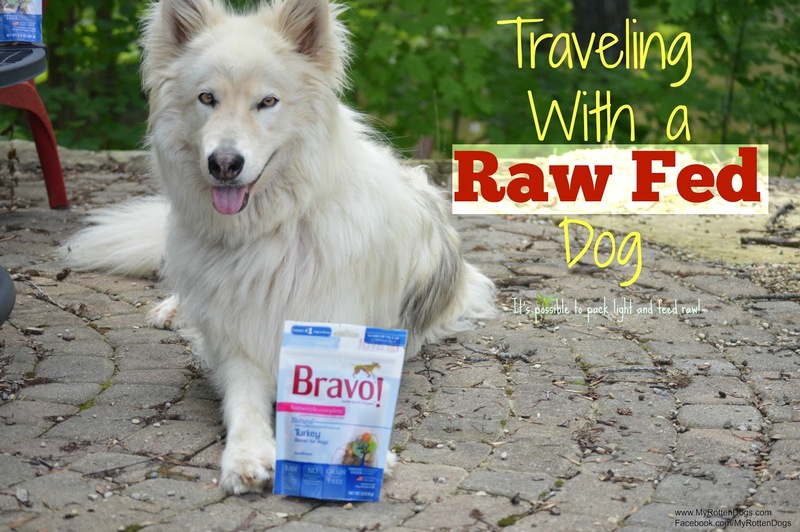 Traveling with a raw fed dog or raw feeding while camping typically involves lugging a heavy cooler full of meat, and trying to keep it sufficiently cold, or purchasing meat on the go at grocery stores. Neither is very convenient, both in terms of time and effort. One doesn't want to lug large amounts of raw meat with them, or spend precious leisure time in the grocery store each day. 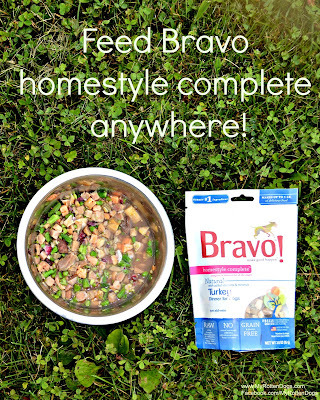 Bravo Homestyle Completes are balanced meals containing freeze-dried raw meat, vegetables and cranberries. Once rehydrated with warm water, a 3 ounce bag makes 1 pound of food! Warm tap water can be used, or water warmed over a camp fire. After it's rehydrated, it smells like beef stew! Made me hungry. My dogs, even picky Neeko, love them. Bravo Homestyle Complete Dinners are shelf stable, and easily portable. They (along with raw fresh meat) ensure adequate hydration in a dog, due to the high moisture content. Traveling can be stressful for a dog, and increase their metabolic rate. So keeping them well-hydrated is important. Bravo Homestyle Complete can be fed anywhere. Inside, outside, in a tent, in a hotel, in a camper. Anywhere. They are super convenient, easy to prepare, high quality raw meals. What's not to like? They can be used as a complete meal, a snack/treat, or as a kibble topper for those looking to add a bit of raw/less processed food to their dog's diet. 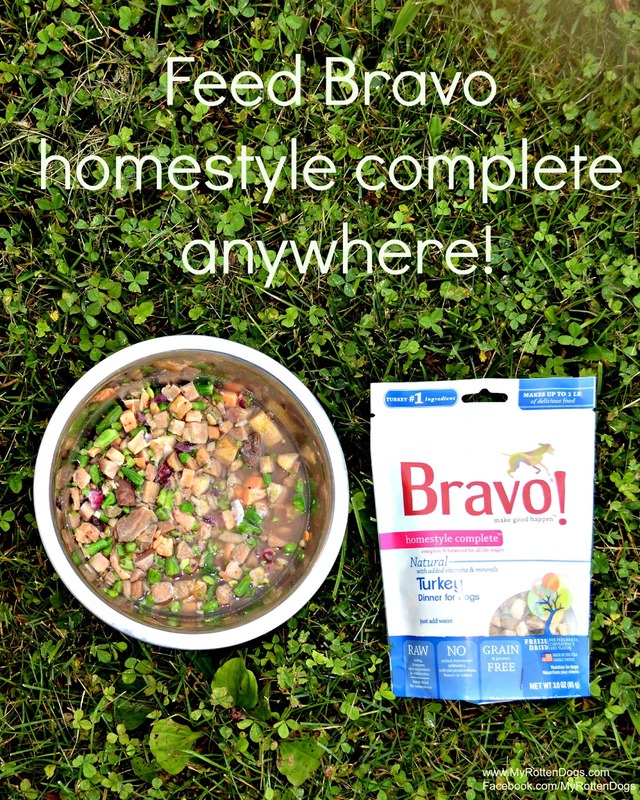 Ditch the dog food cooler and pick up some Bravo Homestyle Complete the next time you travel with your raw fed dog! This post was sponsored by Bravo Pet Foods. All opinions are my own. Shiner tried those recently and they smell SO good! She loved them! Definitely a good dog food for traveling. Or any time really. Our dogs LOVE Bravo's dehydrated draw. It smells like Stove Top Stuffing. I love that you can see the chunks of fruits and veggies. Bravo! I have to confess that when we go on the road, I just bring a super high quality kibble and organic canned food. My guys are thrilled at the change even if I feel like I am letting them eat junk food! LOL! thanks for the review, this product has been doing really well for us, more so than honest kitchen even (I like both), some dogs just prefer heartier texture. I like the fact that it's meat based unlike sojos which equals less pooping and it does not smell like dog food when you rehydrate it. A typical blame of the social canine and proprietor: Just on the grounds that you are inviting, out-going individual does not mean everybody needs to acknowledge your benevolent, and out-going signals. The notion of a great day in the park for me is often very different from a person with a single dog or who doesn't come to the park that often. Fascinating article. I would love to be a part of something like this. From what I've concluded through training my dogs, food is the way to go. My dachshund would definitely prefer sausage. For more info click this site get about foods for dog.